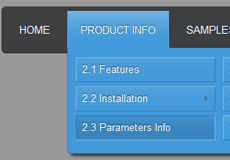 Nice Drop Down Menus with CSS3 Shadow! The new shadow parameters in CSS3 are a perfect way of filling a website with excellent graphics without using Photoshop or similar image editing software. CSS3 text shadows, boxes with a hint of 3D, cool-looking paper curls, dynamic navigation menus and much more, all these features have been made possible by the power of CSS3 alone. Every new variable and extra parameter is a step up from the initial capabilities of CSS2, making web developers eager to switch their websites over to the new officially recognized standard! The transition is made slower by the unwillingness of Internet Explorer to include full CSS3 support to their 9th version, but as IE10 comes out, everything and everyone is expected to switch over to CSS3 for good. Nevertheless, despite everyone’s growing interest in building their websites with the superior backing of CSS3 text or box shadow parameters, as well as many others, there has not been enough time given for all web designers to familiarize themselves with all the tips and tricks of this latest addition to Cascading Style Sheets. Further research is required on part of a number of people to get into the CSS3 mindset completely and start making history with innovative website designs that are sure to draw the attention of Internet users. One of the best ways to test every single aspect of new and improved handling of shadows is to visit an online CSS3 shadow generator. With access to all relevant parameters and variables in a single place, any Internet user with a sense of style will be able to create a nice-looking shadow. Once the multitude of different features have been explored, they can proceed with fulfilling their ideas and building CSS3 shadows that will later serve as a basis for some future projects. As it has been proved by several web designers already, a website improves greatly when its navigation menu, for example, is complimented by a nice set of CSS3 shadows. If used correctly, they have a potential to surround the whole site in an aura of professionalism, which none of its visitors will be able to miss or ignore. The more time is spent testing out different parameter combinations in a CSS3 shadow generator, the better prepared a web builder will be to face real decisions within an actual website project. When used together with helpful and thorough CSS3 tutorials, the online generator service will yield the best possible results that will positively reflect on a designer’s future performance. Using a CSS3 shadow generator often leads to much better results than dealing with the new features for the first time in complex website building software, or even reading raw coding tutorials. The main advantage of a CSS3 shadow generator before all other ways of learning about shadows in the latest version of Cascading Style Sheets is its focus on a single parameter. The only kind of experience with CSS3 shadows that would work even better than a generator is probably CSS3 Menu, an application which has no learning curve and allows any Internet user with good ideas to build a professional-looking navigation menu from a scratch! Just downloaded your software as we try to find a menu that works with touch screens. Is your menu only horizontal or can it be vertical? I couldn't find where to set it up as vertical. 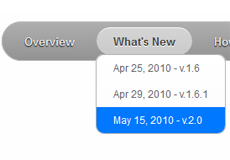 It would be great if CSS3Menu had a search text box menu item with dropdown for search options.